Arnold Stang was a busy radio and movie actor. He was on the cast of Lets Pretend and replaced Eddie Firestone Jr on That Brewster Boy. 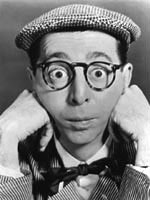 Arnold Stang was in several of CBSRMT comedy-mysteries. And to good effect, in my opinion, as his voice in itself was comical. Probably his stand out character was in The Public Avenger (#376). Arnold Stang was also the voice for 'Top Cat'! It's funny, hearing Top Cat in the CBSRMT.